To begin, I covered the table in a neutral linen tablecloth I picked up last year at Home Goods. Then, as I often do when creating tablescapes, I started with the centerpiece. 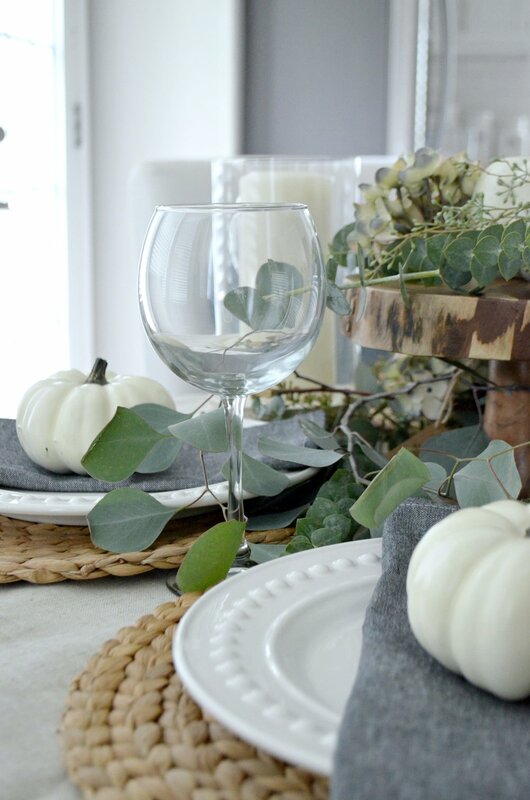 I came across a wood cake stand while shopping a while back at Home Goods, and I knew it would be perfect for my fall tablescape. 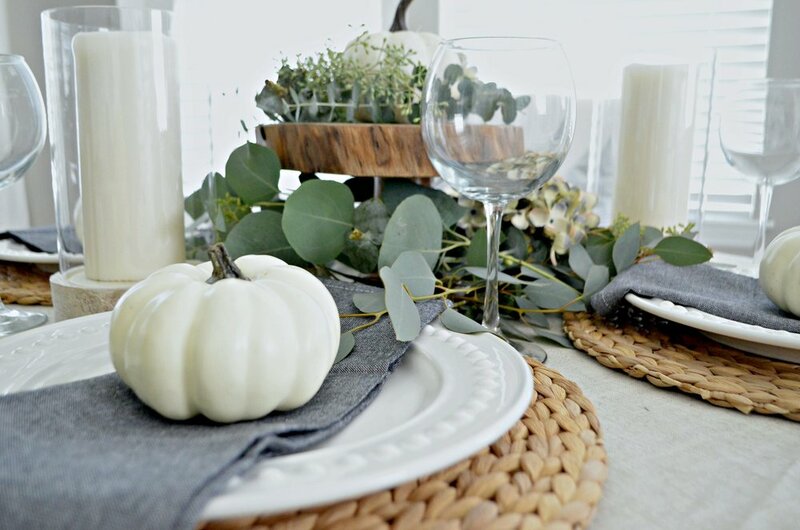 I simply topped it with a white pumpkin, fresh eucalyptus, and dried hydrangeas, for an easy centerpiece. By the way, fresh eucalyptus is my latest obsession. I buy it for $3/bunch at Trader Joes. Simply add a bunch to a glass vase or a white pitcher for instant style to any room. After I complete the centerpiece, I start thinking about the place settings. Here, I started with woven chargers in a wood tone color. I topped them with white plates and chambray blue napkins from--where else?--Home Goods. 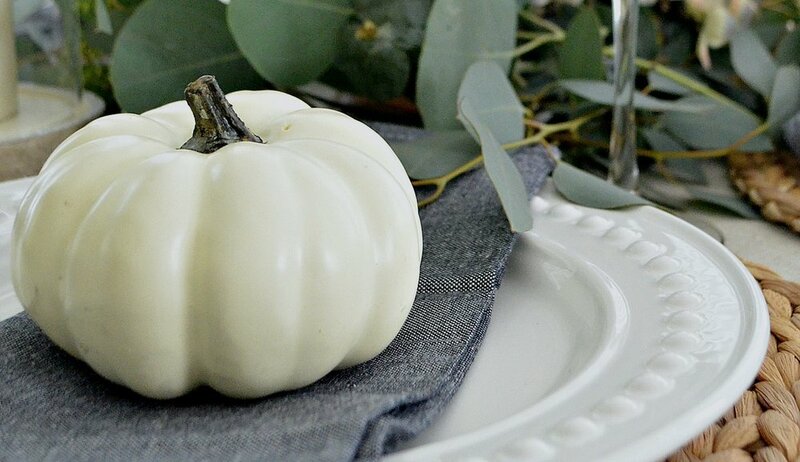 On top of each napkin, I added a small white pumpkin, which I found at Target. This is a small round table, with settings for 4, so I didn't add any names for place settings. If you have a larger table, you could tie kraft paper or chalkboard tags with jute twine around the stems of each pumpkin so guests will know where to sit. And there you have it, friends! Easy, Neutral, Fall. For more fall décor inspiration this season, check back each Friday here on the blog, and over on Instagram, where I'm sharing all kinds of fall décor inspiration.